Providing the most advanced dental care in a pleasant and comfortable atmosphere are priorities of Dr . Hamasagar. He is diligent in his persuit to stay current in providing the profession's leading dental care procedures while utilizing state-of-the art technology, supplies and equipment. 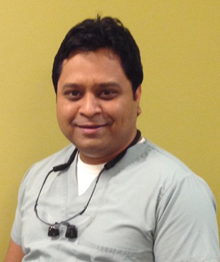 Dr Hamasagar graduated with a dental degree (DDS) from India in 2002 and provided dental care over a period of 6 years. Graduated with a DDS degree from UIC college of dentistry in 2012 and since then have been providing dental care for adults and children in the Chicago land area. He is an active member of American dental association. Keeps his knowledge and skill current by attending seminars, CE courses and reading journals.